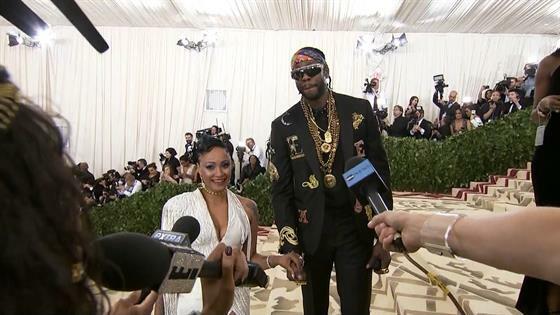 2 Chainz is finally a married man! The rapper, whose real name is Tauheed Epps, and his longtime girlfriend, Kesha Ward, said "I do" in front of family and friends on Saturday, his rep confirmed. The two tied the knot at the Villa Casa Casuarina in Miami, which was once the home to the late designer Gianni Versace. The groom wore a formal tux for the ceremony while his bride wore a mermaid-style gown. A video shows Kesha walking down the aisle to John Legend's "All of Me." However, these weren't the only ensembles the duo wore that evening. The groom also wore a white Louis Vuitton suit while the bride wore a shimmery dress. The couple tied the knot in front of several celebrity guests, including Kim Kardashian, Kanye West, Lil Wayne and more. Their nuptials come just four months after the rapper proposed to Ward on the red carpet of the Met Gala in May. The pair, both clad in custom Versace, turned heads when they suddenly got engaged on the steps leading to the star-studded event. However, their Met Gala engagement was not the first time the "We Own It" performer got down on one knee to ask for Ward's hand in marriage. Back in 2013, 2 Chainz very publicly proposed to the mother of his three children at the BET Awards. Luckily, their long-awaited wedding gave daughters Heaven and Harmony, in addition to their son, Halo, the chance to be there for their parents on the happy occasion. And in the days leading up to the couple's lavish ceremony, the 40-year-old was pumping iron at the gym in preparation for the big day. He recently shared a picture of himself breaking a sweat on Instagram, captioning the moment: "Headed to the beach!"